Puppy Love is a pet grooming business that provides full service for all breeds of dogs and cats in a friendly and loving environment. 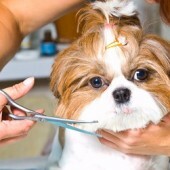 Founded in 1963, our business was developed by experienced pet groomers who love animals and want to keep them healthy, clean, and well-groomed in a safe, nurturing environment. We love dogs and love to keep these beautiful pets always looking their best at all times. Contact us today for more information on our additional services, and for any coupons, special promotions and/or discounts!